BRAUN - ANFA. / AZAAMURUM. / DIU. / GOA. BRAUN, G. / HOGENBERG, F. - ANFA. / AZAAMURUM. / DIU. / GOA. ANFA. / AZAAMURUM. / DIU. / GOA. - BRAUN, G. / HOGENBERG, F.
Title : ANFA. / AZAAMURUM. / DIU. / GOA..
Map maker : BRAUN, G. / HOGENBERG, F.. Size : 13.2 x 18.5 inches. / 33.5 x 47.0 cm. 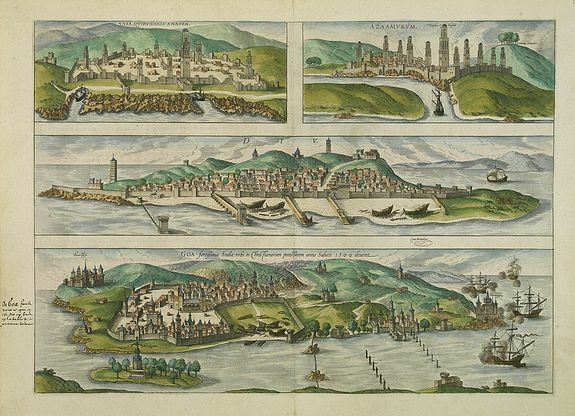 Description :Four fine coastal views of these fortified cities, which were important to European trade with Asia. Goa (130x465mm.) and Diu on the western coast of India, together with Anfa (Casablanca) and Azaamurum on the Atlantic coast of Morocco. The town-viewof Goa is one of the earliest views of this main Portuguese trading post in India, and one of only a few Asian views included in the Civitates Orbis Terrarum. The views depict fortifications, buildings, sailing ships (including a sea battle) and scenes of ship building. Condition : Paper slightly age toned. Some contemporarily marginal notes in brown ink regarding Goa in left hand margin.